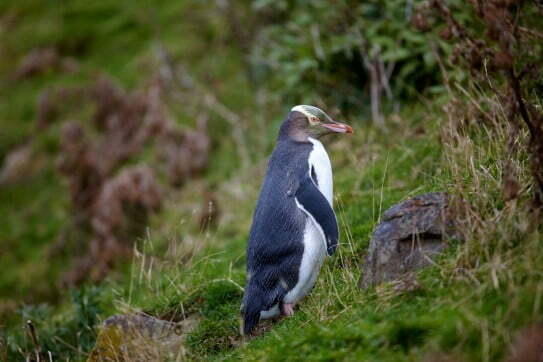 Discover the extraordinary rare creatures that live on and around Dunedin's Otago Peninsula. As well as royal albatross, there are yellow-eyed penguins, little blue penguins and New Zealand fur seals. Around 32 kilometres in length, Otago Peninsula is more than spectacular, it's stupendous. There's a beautiful coastal road punctuated by pretty bays and historic villages, romantic inland roads that meander around hills and farmland, wild surf beaches and sea cliffs. There's even a Lover's Leap. In almost every photo-worthy view, you'll see ocean - huge and unhindered all the way to Antarctica. On top of all this, the peninsula is where you can encounter incredibly rare marine animals and birds. Yellow-eyed and blue penguins, fur seals, sea lions and the biggest seabirds of them all, albatrosses. They're living wild and free, so you get a rare 'David Attenborough' glimpse into their lives. For wildlife watching, we recommended guided tours with local experts to ensure the wellbeing and long-term survival of Dunedin’s rare species. Of all the Dunedin wildlife tours, this one is the most famous. At the Penguin Place, a private conservation reserve, yellow-eyed penguins (Maori name hoiho) go about their daily lives while you watch from carefully-disguised hides. 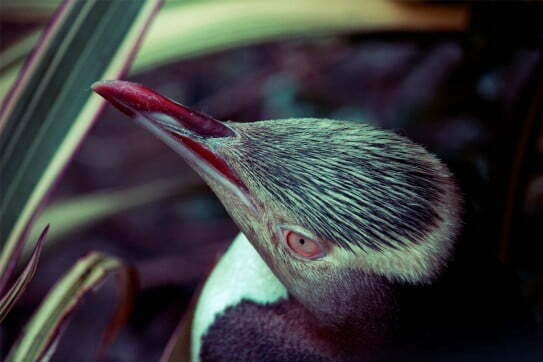 There are fewer than 2,000 breeding pairs of yellow-eyed penguins in the world, so this is a very special experience. Fully grown yellow-eyed penguins are around 75cm tall. They eat mostly krill and nest on land. Because chicks stay with their parents until they're around a year old, there's a good chance you'll see babies as well as grown-ups. Penguin tours operate year-round in the early evening, when the adult birds are arriving home from a busy day of fishing. Much of the money raised by tours goes towards penguin conservation. At the Penguin Place, yellow-eyed penguins go about their daily lives while you watch from carefully-disguised hides. There are fewer than 2,000 breeding pairs of yellow-eyed penguins in the world, so this is a very special experience. Smaller than yellow-eyed penguins, blue penguins (Maori name kororā) are ridiculously cute. An adult weighs about one kilogram and stands just 35cm tall. Instead of the traditional black and white outfit, this little penguin teams a white bib with soft bluey-grey. There are little blue penguins throughout New Zealand, but Otago Peninsula is one of the easiest places to arrange an encounter. On a little blue penguin viewing tour you’ll see the whole end-of-day routine. First, the penguins congregate in the water just off the beach. You'll hear them discussing the day, penguin style, with honks and loud squawks. Then they make their way into the beach, where they waddle up the sand to their nests. While this is going on, you’ll be watching from a purpose-built viewing platform. Income from the tours goes towards planting native trees, installing nesting boxes and controlling predators. 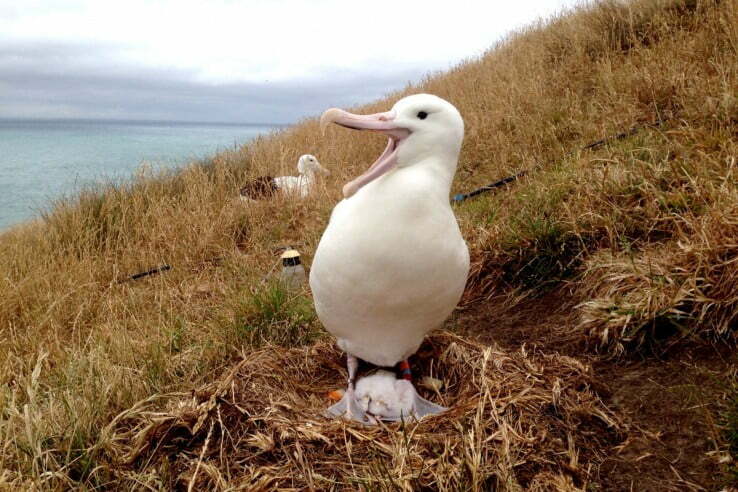 Right at the tip of Otago Peninsula is the Royal Albatross Centre, where you can visit the world's only mainland breeding colony of royal albatross and choose from a range of albatross tours. The birds are constantly arriving and leaving the colony, so you can enjoy watching their superlative flying skills. You'll soon distinguish the albatrosses from the regular gulls - they are huge by comparison, with a wingspan of up to three metres. From viewing areas on Taiaroa Head, you can also witness the social and family life of the colony. Albatross live here year-round, but the best time to see albatross action is January to September. Find out about other outdoor things to do in Dunedin.